Mustela nivalis (weasel) has a long slender body and short limbs; a long neck and a flat, narrow head; large, black eyes; relatively large, rounded ears; and long vibrissae. Summer pelage is about 10mm in length and generally is chocolate brown on the dorsal side. The white underparts often have brown spots or blotches. The line of demarcation between the upperbrown and the lower-white colours is straight in most forms and irregular in some European and American forms. Winter pelage is ca. 15-16mm in length and is entirely white in northern populations, but remains brown in southern populations. The feet, each with five digits, have sharp non-retractable, curved claws, and the soles, except the pads, are fully furred (taken from Sheffield and King, 1994). It is the smallest member of the Order Carnivora. Weasels are smaller than stoats and do not have a black tail tip. Pronounced sexual dimorphism with males is larger. A range of different subspecies exist worldwide. The subspecies introduced to New Zealand (M. n. vulgaris) is native to west and central Europe. Weasels have not fared well in New Zealand and are only present at low densities. This is probably due to insufficient food as Mus musculus is the only suitable rodent prey present in New Zealand and numbers are often not sufficient to support a population. The gestation period of Mustela nivalis (weasel) is 34-37 days . Young are born naked, blind and deaf. Weaning begins at 32 days, permanent dentition grows by 40-42 days and weaning is complete around 42-56 days. Young weasels are able to kill prey at around 38 days. Adult body mass is achieved between weeks 12 and 15. Mustela nivalis (weasel) has been introduced outside of its native range to control rabbits and rodents. As with stoats (Mustela erminea), weasels proved ineffective in this role and they rapidly became a pest species. Mustela nivalis (weasels) prefer thick ground cover, so they favour overgrown patches of any habitat from suburban gardens to agricultural land, in scrub and cutover native or exotic forest or at the margins between these and open country (King, 2005). Weasels are commonly found in riparian habitats in North America. Snow does not impede weasels hunting in the slightest and they range above the treeline in arctic and alpine areas (Sheffield and King, 1994). Ovulation is induced by the stimulus of copulation and, unlike stoats, weasels do not delay implantation. Litter sizes in the native range average around 6.5 and in the introduced range in New Zealand the litter size averages 4.5. Females may produce two litters per year but mortality is often high in the second litter. Females become sexually mature at around three months and in periods of ample food spring-born females may breed in their first year. Mustela nivalis (weasel) is a specialised predator of small rodents such as voles and mice. Weasels are able to alter their diet to follow changes in relative abundances of different rodents throughout the year. They may also take bird's eggs, small lagomorphs, beetles, carrion and lizards if food is scarce (Sheffield and King, 1994). In their introduced range in New Zealand weasel stomachs have been found to contain birds, lizards, mice, lagomorphs, skinks, other lizards, geckos and wetas (King, 2005). King, C.M., 2005. Weasel. In: The Handbook of New Zealand Mammals (ed C.M. King) pp. 81-94. Oxford University Press, Auckland. Recommended citation: Global Invasive Species Database (2019) Species profile: Mustela nivalis. Downloaded from http://www.iucngisd.org/gisd/species.php?sc=443 on 21-04-2019. Mustela nivalis (weasels) are voracious predators and they are able to take a wide variety of prey. In the introduced range of the species in New Zealand mice account for a large portion of their diet but native birds, invertebrates and reptiles are also taken (King, 2005). Weasels in New Zealand have been recorded feeding on Whitaker’s skinks (see Cyclodina whitakeri in IUCN Red List of Threatened Species) in the last mainland population of this endemic species (Hoare et al., 2007). Whitaker’s skinks are listed as vulnerable by the World Conservation Union due to small population size and acute range restriction. Weasels have also been introduced to Sao Tomé Island off West Africa as a means of rodent control and are now considered a significant threat to the critically endangered endemic white toothed shrew (see Crocidura thomensis in IUCN Red List of Threatened Species) (Dutton, 1994). Physical: In the UK Mustela nivalis (weasels) are not regarded as a particular threat by gamekeepers but they are legally shot and trapped to protect game birds (McDonald et al. 1998). In New Zealand stoats are far commoner than weasels so most predator control programmes focus on catching stoats and any weasels killed are an additional benefit (King, 1995). 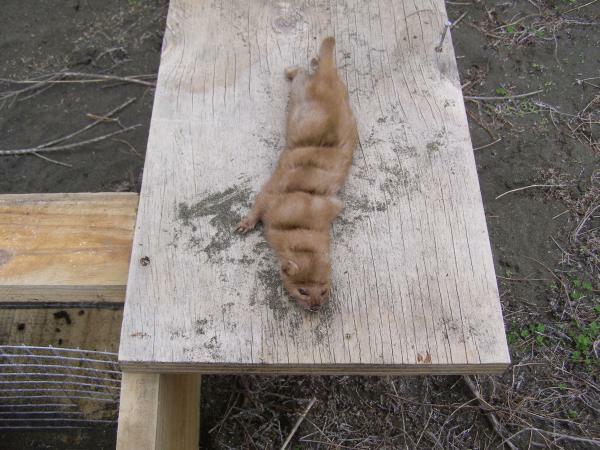 The Fenn trap is the most commonly used device for catching weasels and over 6 years of trapping at Trounsen Kauri Park in Northland, New Zealand 98.5% of all weasels caught were trapped in Fenn traps. 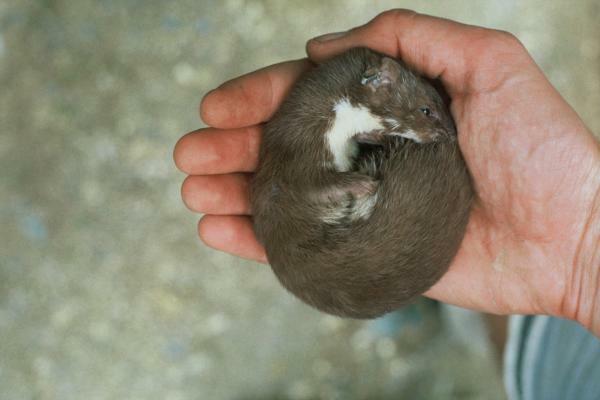 Only 66 weasels were caught in the course of this study compared to 268 stoats (Gillies et al. 2003). Regional Councils in New Zealand encourage community groups to set up predator control programmes and councils are able to provide advice, support, equipment and sometimes funding to such groups (see links to Auckland and Northland Regional Council websites). Chemical: Weasels are also susceptible to secondary poisoning through the consumption of rodents that have been exposed to anticoagulant toxins (McDonald et al. 1998; Murphy et al. 1998). In a study of weasels and stoats trapped or shot on British game estates, McDonald et al. (1998) found that 3 out of the 10 weasels examined had been exposed to anticoagulant toxins. Levels of toxin were generally low and the authors were unable to comment on likely lethal doses for weasels. It is unlikely that any animals exposed to a lethal dose of toxin would be found as weasels tend to be secretive and hide in burrows if they are unwell (McDonald et al. 1998). A study in New Zealand found that 71% of 14 weasels trapped following brodifacoum poisoning to control rats and possums contained traces of toxin. Informations on Mustela nivalis has been recorded for the following locations. Click on the name for additional informations. Bellingham, M. and White, P. 2004. Matuku Reserve Management Plan. Waitakere Branch Royal Forest and Bird Protection Society of New Zealand Inc.
Blunden, G., pers. comm. 2008. Blunden, Greg. NZ Kiwi Foundation Convenor, Kerikeri, New Zealand. Environment Bay of Plenty Regional Council. 2003. Bay of Plenty Regional Pest Management Strategy. Operative 2003-2008. EBOP Operations Report 2003/10. Environment Canterbury. 2007. Canterbury Regional Pest Management Strategy (2005-2015). Operational Plan for 2007-08. Environment Southland. Undated. Mustelids. Pest Animal Factsheet. Environment Waikato. 2002. Waikato Regional Pest Management Strategy 2002-2007: Appendix 2: National Pest Plant Accord. Environment Waikato (Waikato Regional Council): Waikato. Environment Waikato. 2008. Mustelids Fact Sheet. Gisborne District Council. 2004. Gisborne District Regional Pest Management Strategy 2004-2009. Greater Wellington Regional Council. 2002. Greater Wellington Regional Pest Management Strategy, 2002-2022. Biosecurity Department, Greater Wellington - The Regional Council. Greater Wellington Regional Council. 2004. Mustelid Information. Green, B., pers. comm., 2008. Barry Green. Senior Ranger, Regional Parks. Auckland Regional Council. Grove, C., pers. comm., 2008. Caroline Grove. Chair, Lone Kauri Restoration Trust. Karekare. Auckland. New Zealand. Hamilton, T., 2007. Whangarei Heads Landcare Forum Predator Trapping Report 2006/07 prepared for NZ Landcare Trust by trapper, Todd Hamilton. Hawke s Bay Regional Council. 2006. Regional Pest Management Strategy 2006. Biosecurity Section, Hawke s Bay Regional Council. Horizons Regional Council. 2002. Mustelids Fact Sheet. Jack and Sumich, 2006. Ark in the Park Restoration Project Annual Report, 1 July 2005-30 June 2006. Presented to various stakeholders in December 2006. Kaipatiki Project Environment Centre. Undated. Pests. King, C.M., 2005. Weasel. In: The Handbook of New Zealand Mammals (ed C.M. King) pp. 287-294. Oxford University Press, Auckland. Lone Kauri Restoration Group. 2002. Maungatautari Ecological Island Trust. 2008. Pest eradication: Latest news. Moodie, H. pers. comm. 2008. Helen Moodie, Local co-ordinator for the New Zealand Landcare Trust. Otago Regional Council. 2001. Pest Management Strategy for Otago. Pierce, R.J., September 2006. Technical support visit to Whangarei Heads Landcare Forum. Report prepared for NZ Landcare Trust. PO BOX 4327. Kamo. Northland. Taranaki Regional Council. 2007. Pest Management Strategy for Taranaki: Animals. Taranaki Regional Council, Stratford. Tasman District Council and Nelson City Council. 2007. Tasman-Nelson Regional Pest Management Strategy 2007-2012. Tawharanui Open Sanctuary Society Inc. 2008. Website. Walden, T., pers. comm., 2008. Tony Walden, Co-owner/Manager, Oneriri Farm. Northern Kaipara District. Northland. New Zealand. Andersen, Kenneth W. 1970. Recent Records of Mustela nivalis from Kansas. Transactions of the Kansas Academy of Science (1903-), Vol. 73, No. 3. (Autumn, 1970), pp. 404-406. Bailey, Virleen; Max R. Terman., 1986. 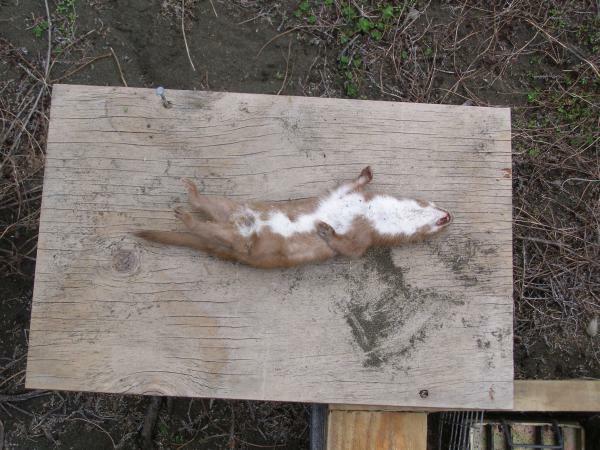 Update on the Least Weasel (Mustela nivalis) in Kansas. Transactions of the Kansas Academy of Science (1903-), Vol. 89, No. 1/2. (1986), pp. 62-65. BirdLife International. 2004. Amaurocichla bocagei. In IUCN 2007: 2007 IUCN Red List of Threatened Species. BirdLife International. 2007. Bostrychia bocagei. In IUCN 2007: 2007 IUCN Red List of Threatened Species. Choate, Jerry R.; Mark D. Engstrom; Robert B. Wilhelm., 1979. Historical Biogeography of the Least Weasel in Kansas. Transactions of the Kansas Academy of Science (1903-), Vol. 82, No. 4. (1979), pp. 231-234. Dobson, M. 1998. Mammal distributions in the western Mediterranean: the role of human intervention. Mammal Review. 28 (2): 77-88. Summary: Discussion of the origins of mammalian species in the Maghreb region of North Africa. Dobson, M., 1998. Mammal distributions in the western Mediterranean: the role of human intervention Mammal Review 28 (2), 77�88. NatureServe. 2007. Mustela nivalis - Linnaeus, 1766. NatureServe Explorer: An online encyclopedia of life [web application]. Version 6.2. NatureServe, Arlington, Virginia. Sheffield, Steven R.; Carolyn M. King. 1994. Mustela nivalis. Mammalian Species, No. 454. (Jun. 2, 1994), pp. 1-10. Swan, Tom., 1977. Additional Records of the Least Weasel in Kansas. Transactions of the Kansas Academy of Science (1903-), Vol. 80, No. 3/4. (Autumn - Winter, 1977), pp. 159-160. Thibault, J-C; Delaugerre, M; Cheylan, G; Guyot, I; Miniconi, R. 1987. The Lavezzi Islands land vertebrates (excluding domesticated species) (southern Corsica, France). Bulletin mensuel de la Societe Linneenne de Lyon. Lyon. Vol. 56, no. 3, pp. 73-75. 1987. Towns, D.R., Daugherty, C.H. and Cree, A. 2001. Raising the prospects for a forgotten fauna: a review of 10 years of conservation effort for New Zealand reptiles. Biological Conservation. 99 (1): 3-16. Summary: This paper discusses the conservation issues facing New Zealand s endemic reptiles.